Maybe this is an indication that I shouldn’t be blogging at 11:59 P.M., but I’m going to be honest. Getting the majority of my calories from plant-based sources is not a recipe for a quiet, floral-smelling home, if you catch my drift. Everything else about my health feels better when I don’t eat meat, but that is just one side effect I can’t shake, no matter how “used to” veggies and beans and legumes I get. So could someone explain to me why I would want a vegetarian chili recipe brimming with beans and only beans? To drive my fiance halfway down the block? Every time I’m hungry for chili, which is most fall and winter weekends, I go to the internet and it fails me. Clearly I’m starting the weekend on an optimistic note. I think that maybe I’ll branch out from the two or three veg chili recipes in my repertoire, but most of what I find is magical fruit chili. 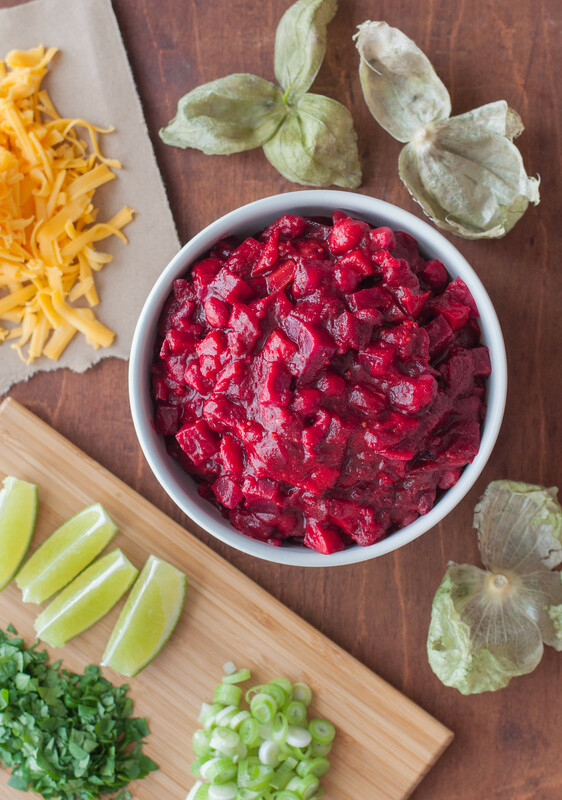 Since first formulating this beet chili recipe last spring, I’ve debated over the texture. Are root vegetables just too firm and awkward in chili? Should Emeril be considered the final authority on vegetarian chili, given the success (in my kitchen) of his mushroom version or southwest variation with caramelized squash? Despite the critical bias I have toward my own recipes, I do keep coming back to this colorful beet concoction precisely because it’s unexpected. This time around, I got it to the point where I’m proud to post it here, and I’m adamant that you need to make it, then consume it over a baked potato or cheesy grits (go big or go home) with every conceiveable topping. Hey, if I was doing it over, and I might, given the quantity of beet chili now in my freezer, I would even take ten minutes to prep fluorescent purple pickled red onions (recipe here). 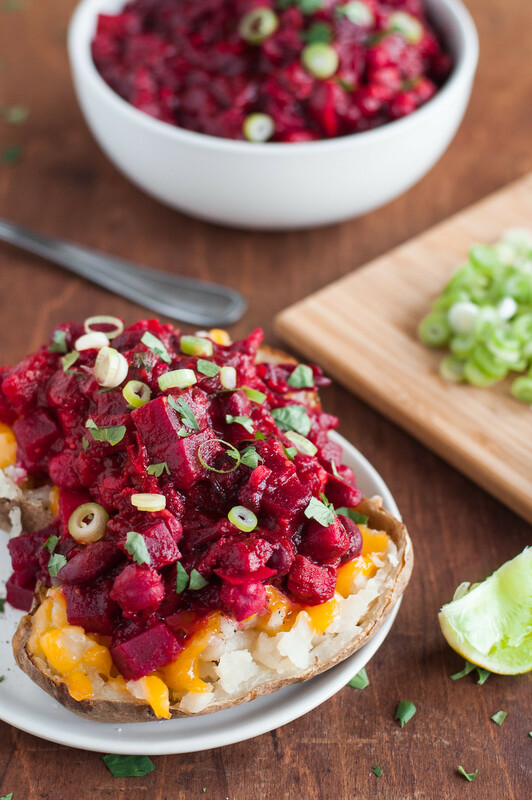 Bright purple condiments and pink-ish red chili–I can’t think of a prettier dish for your next cozy dinner by the fire or football Sunday. So you can see the colors of the food in natural light, of course. Those colors prompted me taking about a hundred pictures of this pot of chili as it came together. 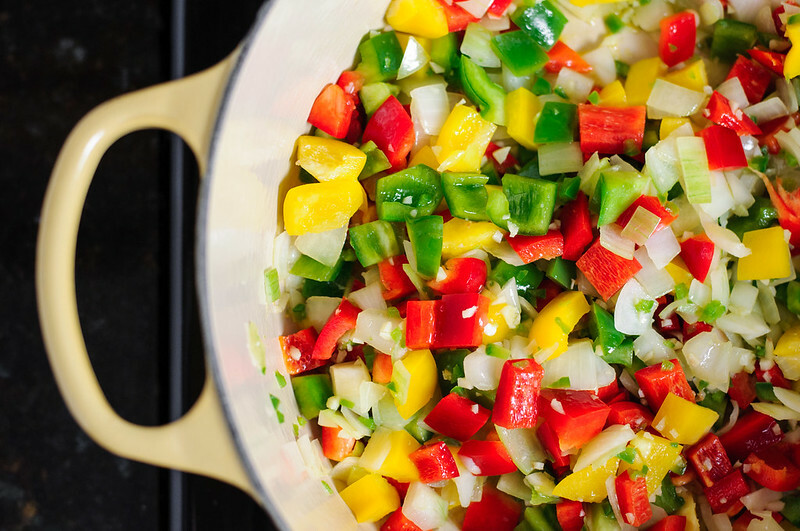 You get these crisp, clear, bright greens and reds and yellows (depending on your bell pepper color choice) as you sweat the first round of veggies. 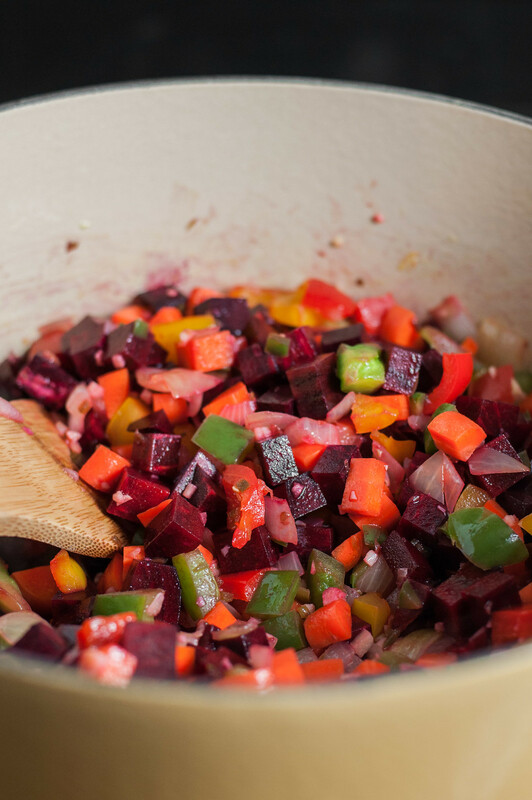 Once the spices go in, the colors start to get a little mucky, but then, wait for it, because things get wild when the beets go in with a bang. Things start to look a little creepy, but mostly just fascinating, as hot pink and dark red juices bubble away in the bottom of the pot. Don’t forget about the tomatillos, though! Toma-what? If you’ve not cooked with them (or heard of them) before, never fear. Most likely, your grocer carries them and you don’t even know it. I can find them at every store from the budget chain to the gourmet market. They look like a little green tomato, wrapped in a papery husk of the same color. When you remove the husk, which is effortless, the “fruit” has an invisible, somewhat sticky coating. I lightly scrub to remove some of the coating, and you’ll find a firm center to the fruit when you cut into it, not juice like a tomato. When you broil them, though, they will release some juices and start to resemble a roasted tomato. I’ve added them to the chili for a couple reasons. The charred, broiled skin looks pretty, plus it lends a hint of smoky flavor, while also adding lots of acidic tang to balance the extra sweetness of the beets. Since the beets are sweet, you may be tempted to skip the honey or sweetener–please don’t. The beets, along with sweetness, can carry some bitter flavors, so I like the pure sweetness of honey to offset that. Given its festive (okay, Christmas) colors, it would be really fun (and simpler than many other options) to serve this chili up at a casual holiday party. Or even a fancy holiday party. Everyone dressed up nice, drinking wine, and digging into a bowl of chili with a side of cornbread? It may be unexpected, but I bet you guests would go crazy with delight. 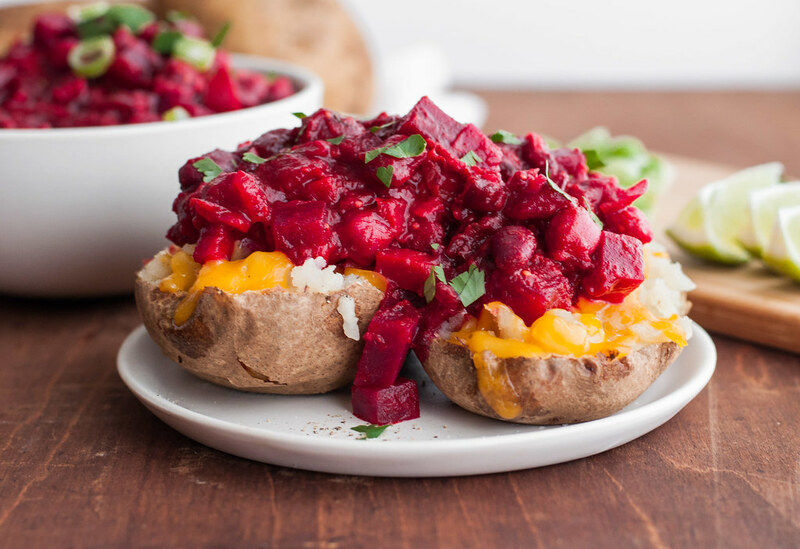 Here’s what I envision: an oven full of warm, just finished baked potatoes, two crockpots or Dutch ovens filled with chili (this vegetarian one plus a meat option) that you made two days ago, and toppings for days (see the recipe for all my ideas). I’ve also been fantasizing about cornbread croutons, which would make a great crunchy, starchy addition if you forgo potatoes. For drinks, I’d do one medium bodied red wine and a gluten-free beer. I was planning a Mexican-themed new year’s eve menu, but I think I just caused myself to reconsider. Our holiday season has been, and will continue to be, pretty low key, so I don’t have a ton of big party menus to plan. Instead, we (Steve and I) are savoring the quieter moments, including dinner at home together most nights. Coincidentally, lots of what I’ve been cooking sticks with the red and green theme, so when the majority of Pinterest is bringing you party appetizers and the 9th side on your Christmas dinner menu, keep coming back here for simple, comforting, meatless dinner recipes (most of which still happen to be fit for a crowd). Like homemade gnocchi with creamy roasted red pepper sauce and truffled goat cheese next Friday, which I cannot wait to make again and share here. Since I’m leaving Steve alone for a week (sad face) as I head to Minnesota (happy face) before he joins me for my sister’s wedding, I’m slowly stocking the freezer for him over the next couple weeks. I’m just making extra of what I’m already making for dinners, because I won’t have time two nights before I leave to go on a freezer cooking extravaganza (I think that only happens in Pioneer Woman land–jealous.). I’m also making enough that when I return from two weeks away, we can subsist on what’s in the freezer and pantry (and wine fridge!) for a week, supplemented with just a few fresh items picked up on quick grocery runs. Now that’s a recipe for holiday happiness. Just say no to brown, bean-filled vegetarian chili. 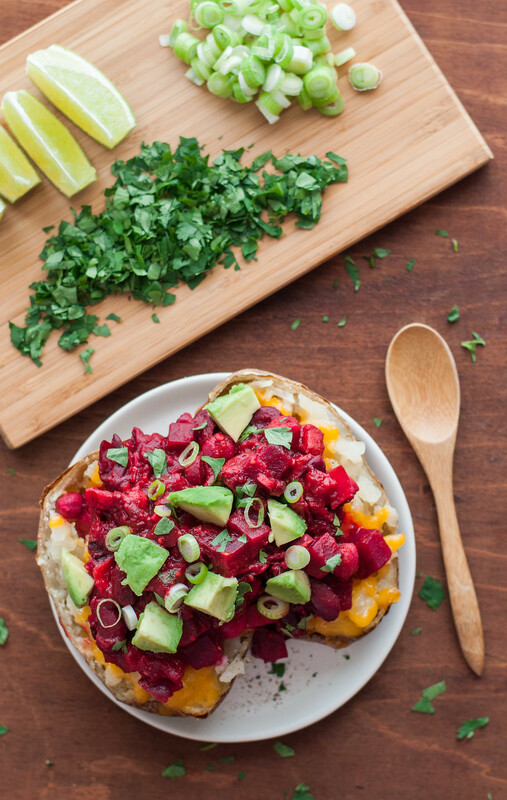 A healthy mix of beets, bell peppers, traditional spices, and even a few beans makes this colorful chili a new keeper. Heat oven to broil and move rack within 6 inches from broiler. Husk, rinse, and quarter tomatillos from top to bottom. Place in a single layer on a rimmed baking sheet and toss with 1 tablespoon olive oil and ¼ teaspoon Kosher salt. Broil tomatillos about 12 minutes, until browned and blistered. Remove from oven and allow to cool until you can handle them. 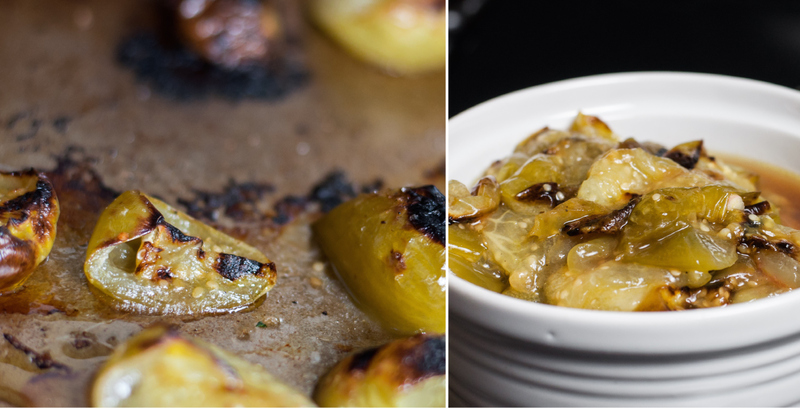 While tomatillos roast and cool, chop other vegetables as detailed in the ingredient list and set aside. After tomatillos cool slightly, roughly chop them and set aside with any juices and seeds. Measure and combine the chili powder, cumin, cayenne and 1¼ teaspoon salt in a small dish and set aside. Heat 2 tablespoons of oil over medium high in a large (at least 5 quart) stock pot or Dutch oven. Add onion, garlic, and jalapeno, and cook, stirring occasionally, for 2 minutes. The onions will not be fully softened at this point. Add chopped bell peppers and stir and cook 5 minutes. 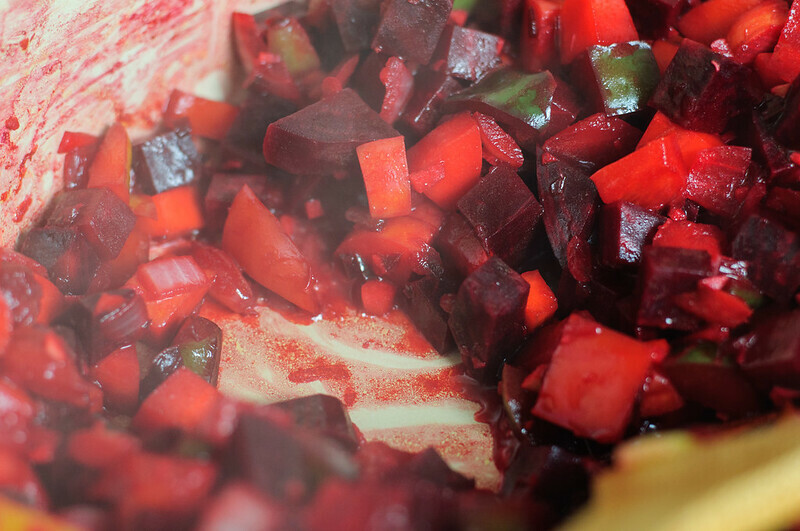 Add carrots and beets and cook, stirring every few minutes, about 8 to 10 minutes, until beginning to soften. Add the spice mix to the pot and stir constantly for about 30 seconds, until you can smell the spices and they begin to stick to the pan. Add diced tomatoes and stir to loosen any browned spices sticking to the pan. Add beans, vegetable stock/broth, tomato sauce, tomatillos and honey. Stir to combine, increase heat to high, and bring to a boil. Reduce heat to a low simmer and partially cover the pot. Continue simmering, stirring occasionally for at least 30 minutes and up to 90 minutes. Season to taste with additional salt before serving, if needed. For an extra filling meal, serve with lots of toppings over baked potatoes, spaghetti squash, or cheesy grits. To make vegan, substitute 1 teaspoon maple syrup, agave, or brown sugar for honey. The chili may taste overly sweet within the first 20 minutes of simmering. After that point, the honey (or vegan sweetener) will incorporate to balance the acidity of the tomatoes without being too sweet. This chilli is definitely perfect for myself and my vegetarian family. 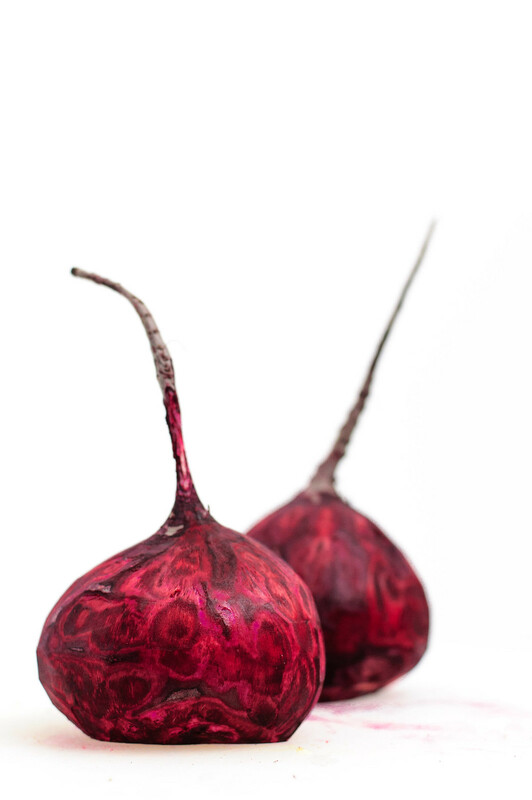 I love that you used beetroot – it is one of my favourite veggies and I do not see enough recipes that use it enough! It’s often forgotten about, but I love the pretty color it gives here! This chili is amazing! 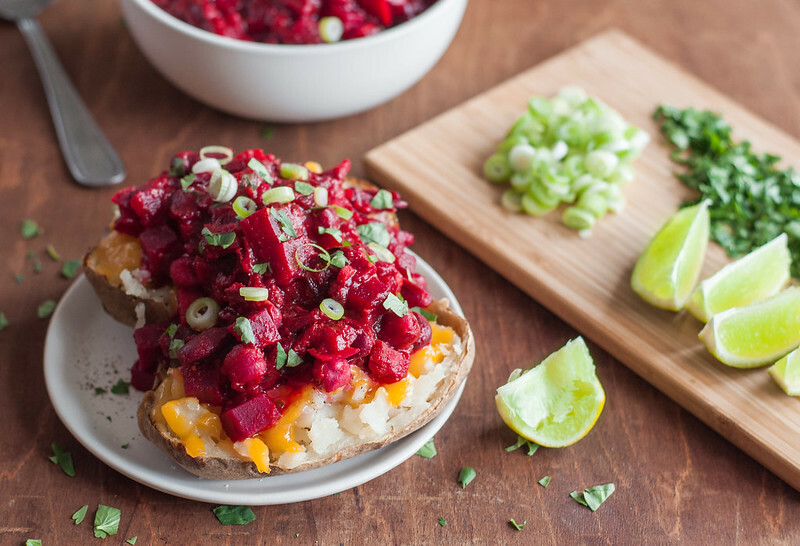 Complex, spicy, and the beets really do show up. I was afraid it would be bean soup. Thanks Ken! I like my chili thick…in my book “quick chili” isn’t a thing. Glad it met (or exceeded) expectations!